Sam Klass, “Scientific Shoe Rebuilder,” learned the cobbler’s trade at his father’s knee, and he kept at it for nearly 40 years at 66 South Street, Jamaica Plain. Based on a 2012 interview with Sheila Klass Lepley. In the days before we became a “throwaway” society, no one was more important than the local cobbler, or shoe repairman. In 1950, there were 449 shoe repair shops in Boston and 23 of them were in Jamaica Plain. (In 2012 the numbers are 24 in Boston and none in Jamaica Plain.) Sam Klass’s workmanship was unrivalled and his prices were fair. With a competitor just a few hundred yards away, Sam had to work hard to survive. Many will remember the sounds and smells of Sam’s one-man shop at 66 South Street where he could put new life into a pair of worn shoes, or dye a pair to meet a new wardrobe’s needs – and he always did it with a smile. He was a happy man. Simon “Sam” Klass was born in Boston on April 23, 1907, and he died in Tucson, Arizona, March 9, 2007, reaching the 100-year milestone with neither fanfare nor, because he had left Boston, a Boston Post Cane. In 1905, his parents, Solomon and Massa, operated a shoe repair shop at 2945 Washington Street, near Egleston Square. They had three children: Max, Esther, and Albert, and they all lived above the shop, which has been replaced by condominiums. 1910 finds Solomon – now called Sam – and Massa, moving the shop to 706 Centre Street, near the present Galway House Pub. They now have four children, with the addition of our Simon “Sam” Klass. 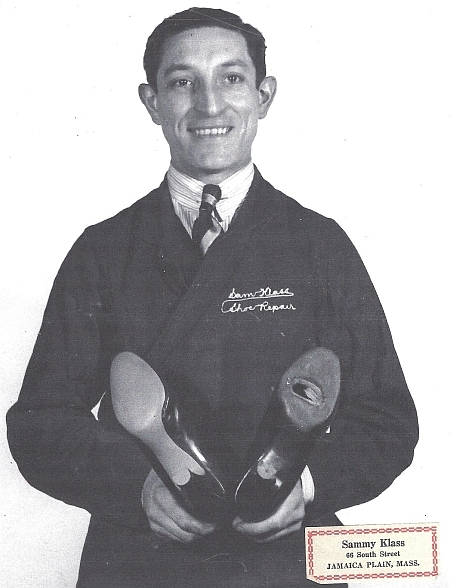 In 1925, Sam Klass, shoe repairman, is listed with a home address of 119 Humbolt Avenue, Roxbury. He is working in his father’s Centre Street shop, because at 18, Sam was hardly ready to be running his own shop and he was, in fact, helping to raise his three siblings when his mother, Massa, died. By 1930, Sam Klass, shoe repairman, now 23, is shown at 59 South Street, near Custer Street. His home is listed at 62 Crawford Street, Roxbury, where he lives with Albert and Meyer Klass, Joseph Cohen, and Max and Hannah Rines. By 1940 Sam is across the street at 66 South Street, where he worked until retiring in 1967. He and his wife, Helen, whom he married in 1934, are renting an apartment at, coincidentally, 66 Boynton Street until 1959, when they moved to 20 Wellington Hill Street, in Mattapan. Sam Klass with customer in 1930s. Courtesy Sheila Klass Lepley. Sam’s shop was always humming as his business and reputation grew. Sam’s price of 94 cents for new leather soles and rubber heels and his shoe-dying clinics – where every eighth customer’s shoes were dyed free – along with his price list for shoe repairs, makes one wonder where the profit was, and how hard he must have worked to make a decent living. He must have wondered too, because before long, he branched out to selling women’s upscale shoes on Saturdays. He found a source of closed-out shoes from an expensive shoe store on Tremont Street, downtown, and advertised widely in the local and Boston newspapers. As a result, he drew customers from all over the city, selling only on Saturdays, at two pairs for $5, a true bargain in those days. Sheila Klass Lepley, Sam’s daughter, remembers staffing the store on those busy Saturdays, standing at the cash register where the shoes were flying out, keeping her fingers dancing on the keys. She also remembers Sam’s permanently discolored hands from the dyes, polishes, glues and lacquers he used every day, and the smell of leather that he carried wherever he went. She still has some of his leather-cutting knives and uses them daily in her kitchen. The bare-bones shop of the ‘30s later filled up with updated shoe-repair machinery, storage for new and repaired shoes, and seats for new-shoe customers to be fitted. Sam, always in shirt and tie, wore a red monogrammed smock tied tightly at the waist. His broad smile greeted everyone entering the store. He was a happy man. World War II, with the introduction of rationing, saw Sam’s business pick up significantly but without, necessarily, a corresponding boost in profits. Nevertheless, he was always busy, and that’s when he seemed to be happiest. Cobbler at work around 1940. Courtesy Jim McFarland and Wiltshire Cobbler Collection.Cobbler at work, 2012. Courtesy of Eagle Shoe Repair, Norwood, Massachusetts.Cobbler shop, 2012. Courtesy of Eagle Shoe Repair, Norwood, Massachusetts. Notwithstanding the hard work and long hours, Sam Klass was always ready to sew a kid’s baseball or hockey glove, or a dropped stitch in a leather pocketbook or belt, or any other leather repair beyond the owner’s skill, as a goodwill gesture for his customers and neighbors, waving off any offer of payment. He became a fixture on South Street. At a recent gathering of 22 Jamaica Plain seniors, every one of the over-eighty, but still spry, guys fondly remembered Sam and his shop. Sam’s goodwill is still around. 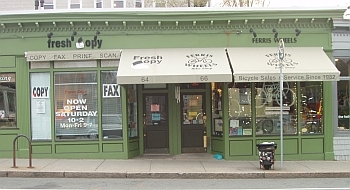 And now that he’s gone, one of the great ironies, his daughter Sheila notes, is how her dad, Sam Klass, faithfully rode his bike to work every day, long after people were buying cars, and now there’s a bike shop at 66 South Street, in his former shoe shop. He would be happy about that. Sam and his wife Helen (Cohen) were married in 1934. Helen (1910-2002) was originally from Chelsea. Sam and Helen had one child, Sheila. Sheila lives at 8841 North Calle, Loma Linda, Tucson, Arizona, 85704. Sheila was a New Year’s Eve baby, born on December 31, 1939, at the Evangeline Booth Memorial Hospital, 202 West Newton Street, in the South End, yielding her parents a much welcomed just-under-the-wire tax deduction. They brought her home to 66 Boynton Street where she remembers a happy childhood among the Irish-Catholic kids who dominated the neighborhood. Sheila Klass, Boynton Street, 1944. Courtesy Sheila Klass Lepley. Although Sheila was not Catholic, this never discouraged her girlfriends from inviting her to sit outside the Saturday afternoon confessional box as they performed the weekly ritual in the lower level of St. Thomas Aquinas Church on South Street. Sheila remembers being accepted as just another kid in the neighborhood, even if the Klasses didn’t display Christmas lights in the apartment windows during the holiday season. She enjoyed the confessional visits, the smell of the candles, and looking at the 14 relief-carved Stations of the Cross on the church walls. Much later ,while touring Europe, she felt completely at home in the many Cathedrals she visited. And now, her Arizona home has year-round Christmas lights running along the eaves. 66 Boynton Street, 2012. Courtesy of Peter O’Brien. Among her pleasant memories of a Boynton Street childhood, Sheila remembers the ice-cream man, the taffy-apple man, the horse-drawn rag-man’s wagon, the hurdy-gurdy man with his trained monkey, the war-time scrap drives, Lilac Sunday at the Arboretum, and playing in an open fire hydrant on a hot summer’s day. She also recalls the lamp-lighter (Mr. Shields), who serviced the gas streetlight across from 66 Boynton Street, various street peddlers and the bowling alley up at the corner of South and Boynton. On the list of unpleasant memories is the terrible odor of the horse-drawn garbage man’s wagon picking up feed for his Dedham pig farm, and the stale beer smell and loud noise reaching the sidewalk from Boyle’s Tavern on South Street. Although her mom regularly shopped in Roxbury for Kosher meats, Sheila remembers the wonderful fresh fruit from Morris and Sons Fruit Stand at 666 Centre, next to Kennedy’s Butter and Egg store near Seaverns Avenue. Woolworth’s and Kresge’s were favorites and she remembers Gale’s Department store and the Odd Fellows Hall above Gale’s. She enjoyed many a treat at the Centre Candy Shop at 713a Centre and, consequently, visits to her dentist, Dr. Dan Mahoney, right above it. And a family friend owned Bell’s Department store at 706 Centre Street near Mamigon’s, at 712 Centre Street, now known as the Galway House, where Sam regularly had lunch. General shopping was done at the First National Store at the Monument. There, during the war, Sheila would proudly handle the ration book stamps and the red-and-blue tokens given as change for sales of meat and processed foods. This was a responsible job for a little girl which would lead later to her cashiering for Sam at the Saturday shoe sales. Nearby Brigham’s Ice Cream Shop and Dorothy Muriel’s Bakery offered wonderful treats on any trip to the Monument. The Klasses enjoyed outings at Jamaica Pond and the Fourth of July celebrations there. Sheila remembers the clean restrooms beneath the bandstand and nearby, the small store that rented boats. Sheila’s mom, Helen, loved taking her to the Boston Pops concerts at the Esplanade, going to the Metropolitan Opera at the Opera House on Huntington Avenue, seeing ballet performances, and taking her to the Museum of Fine Arts and Symphony Hall. The Children’s Museum on Burroughs Street was many a Saturday’s destination for Sheila. She loved playing the clue-hunting games there and the movies shown in the auditorium. 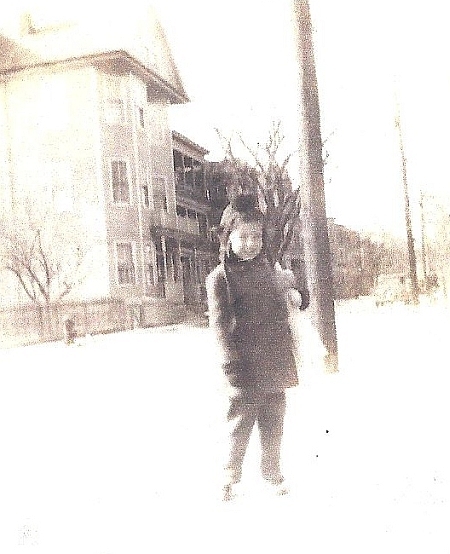 Sheila went to the Agassiz School in its old location on Burroughs Street, followed by the Mary E. Curley School. By then, however, her mother noticed her preoccupation with boys and thought it better if she went to the all-girls Jeremiah E. Burke High School in Roxbury instead of co-ed Jamaica Plain High. Notwithstanding its girls-only student body, she enjoyed the Burke School and made life-long friends there. Agassiz 5th Grade, 1950. 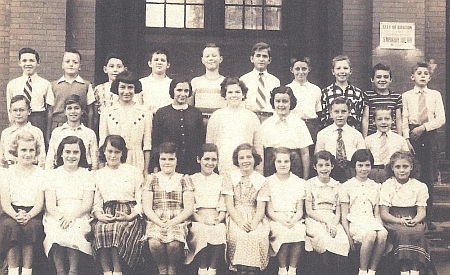 Sheila Klass middle row, third from left. Courtesy Sheila Klass Lepley. She then went on to Suffolk University where she earned a degree in Education and later, from the University of Arizona, a Master’s Degree in Reading, thus fulfilling her mother’s wish for her to graduate from college, the first in the family. She taught in the Saugus School system for two years and in Corner Brook, Newfoundland, for one year where she had to develop an ear for the old English spoken there, tuned previously by the Gaelic and Welsh she heard as a child on Boynton Street. She then taught in Montreal and finally landed a teaching job in Honolulu where she met her husband, Larry Lepley, a farm boy from Michigan. She took a one-year professional leave to travel through Europe and work at an Israeli Kibbutz while studying Hebrew. She returned to Hawaii and married Larry Lepley. Larry became a geophysicist and worked in Europe and the Middle East, finally doing research at the University of Arizona while Sheila taught in Tucson. They settled in Tucson in 1969. They’re both retired now, and enjoy trips to visit their three sons and two grandchildren from Michigan to St. Kitts and Beijing, China, where their youngest son is an architect. Sheila’s memories of being a Jewish kid in a completely welcoming Irish-Catholic neighborhood have endeared her Jamaica Plain childhood all the more. And, although she’s lost touch with most of her Boynton Street friends, she’s never forgotten them: Barbara Flanagan, Gordie MacDonald, the Hall boys, Barbara Gill, Ellen Conway and Agnes Cuddy are just a few of the friends who introduced her to some of the mysteries of the Catholic Church, but more importantly, to the meaning of real friendship and acceptance. Her mother’s stress on the value of education rewarded her humble beginnings as a shoemaker’s daughter with a college education and advanced degrees. She has passed this on to her three sons. Sheila misses her childhood friends, the rich cultural life, and the mountains and shore lines of New England. And when she is asked if she would like to move back, the answer is a resounding “YES – New Englanders have it all.” But she can at least lay claim to having grown up in Jamaica Plain and played with some of the best kids in the world. In a gesture Sam Klass would be proud of, a couple of his shoe forms have been reunited with his family in Arizona. It happened because Joy Silverstein, the owner of Fresh Hair Salon, at 62 South Street, a few doors from Sam’s former shop, found them in her basement and believed they were probably from Sam’s shop. Joy, and Sam’s daughter, Sheila Lepley of Tucson, connected in 2015 and the modest mementos of Sam’s 40 years in business at 66 South Street are now family treasures.